This is a recipe I came up with myself based on other recipes on the internet for Paleo and Vegan versions. I am not full Paleo, I eat goat cheeses and yogurt. For this reason I couldn’t really classify it as Paleo. It is whole and delicious. 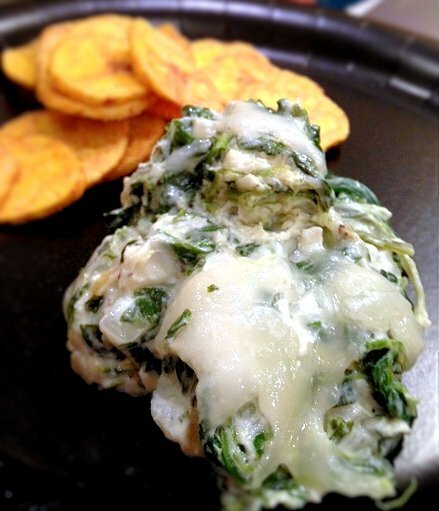 My children practically lick their plates when I make this goat cheese hot spinach and artichoke dip! Saute chopped artichoke hearts, onion and garlic in saute pan with olive oil on medium until onions become translucent. Place sauteed veggies in a blender or food processor with the goat cheese and pulse a few times. Transfer that food processed mixture to a bowl and add in spinach, mayonnaise, salt (I used 7 turns in my sea salt mill) and pepper. Remove from microwave and stir until all ingredients are evenly incorporated. Grate goat cheddar on top. Microwave an additional 2 minutes. Serve with plantain chips. I use Inkas Plantain Chips $1/bag at Big Lots serves 4. I couldn’t give up cheese and yogurt either. This looks amazing.